… we can keep the inconvenient truths buried. 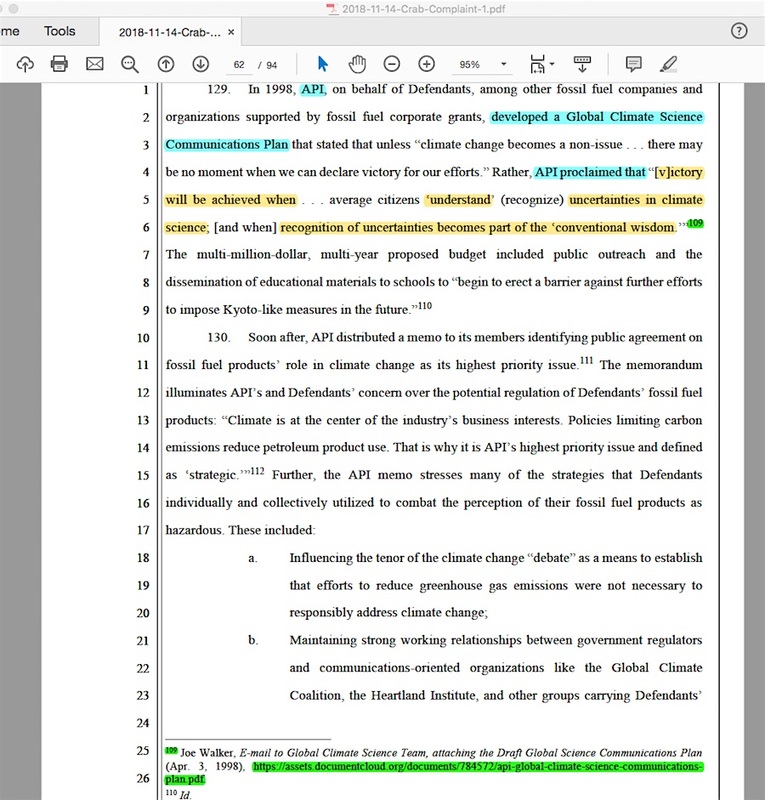 In digging further into this situation, I see an entertaining irony concerning one of the latest global warming lawsuits and the old worthless 1998 American Petroleum Institute (API) “Victory will be achieved …” leaked memo, and I now see something in my work that needed to be corrected (sort of – it isn’t helpful to the people’s actions I dissect). 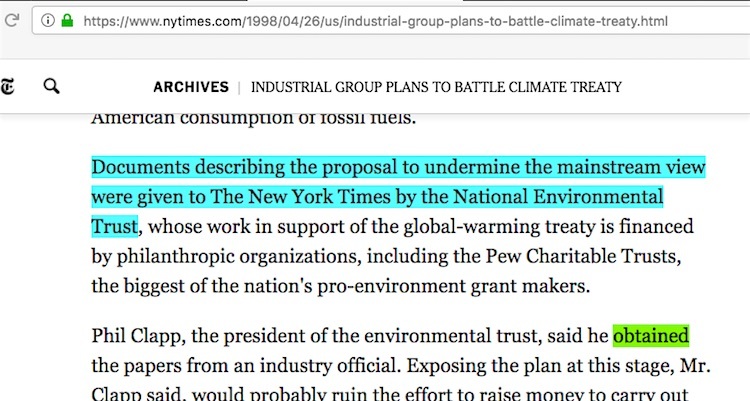 The 1998 New York Times article about the memo said they received it from the National Environmental Trust who in turn say they got it from an “industrial official,” but the article doesn’t show the memo at all. 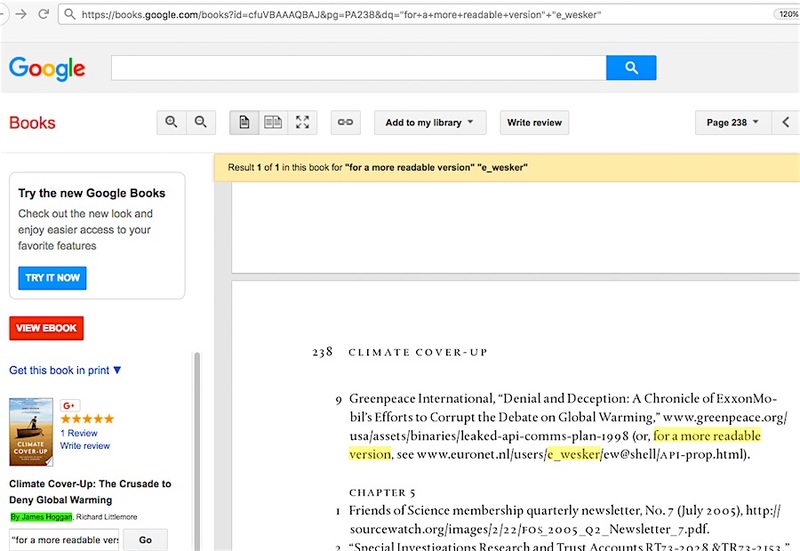 “Climate Cover-up” book author / Desmogblog site co-founder James Hoggan provided a link in his 2009 book to the memo at Greenpeace and said Greenpeace was the group that discovered it and was first to put it online. 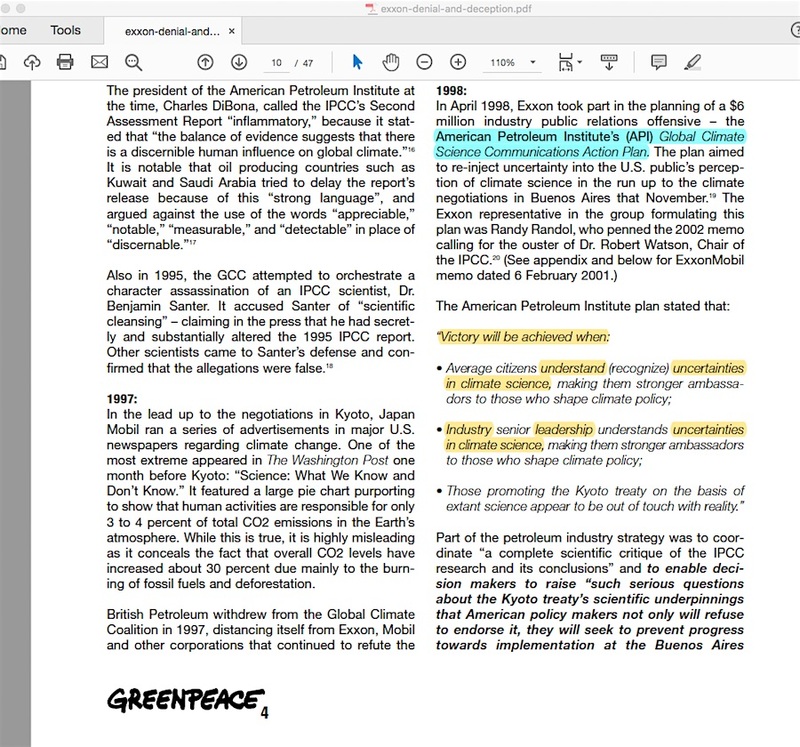 Greenpeace’s 2002 “Denial and Deception” report summarized the memo. 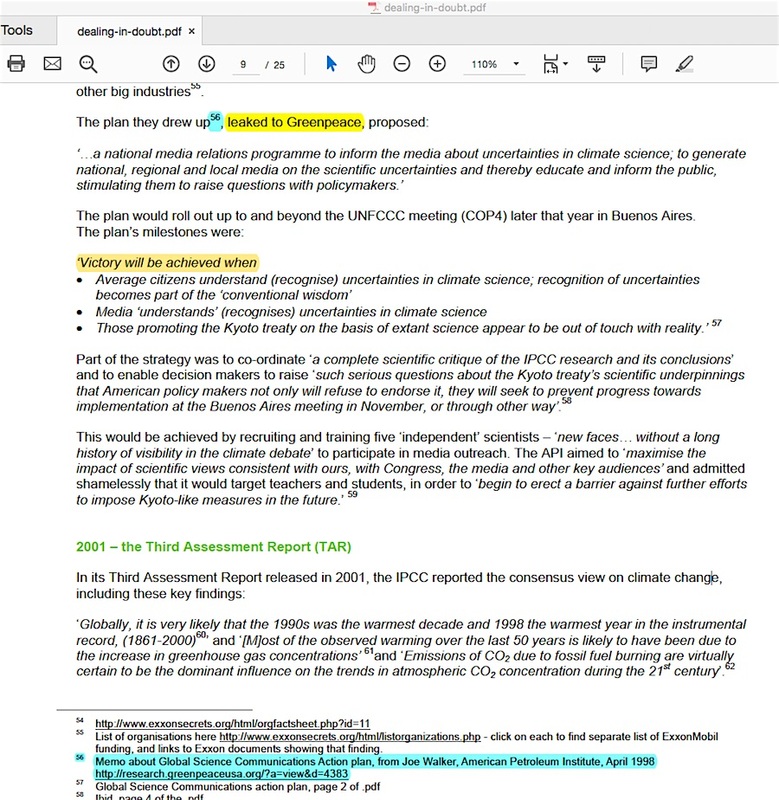 Now, what I had to fix in my prior blog post was my incorrect assumption about Greenpeace’s scans of the memo being in an Appendix attached to their 2002 “Denial and Deception” report. 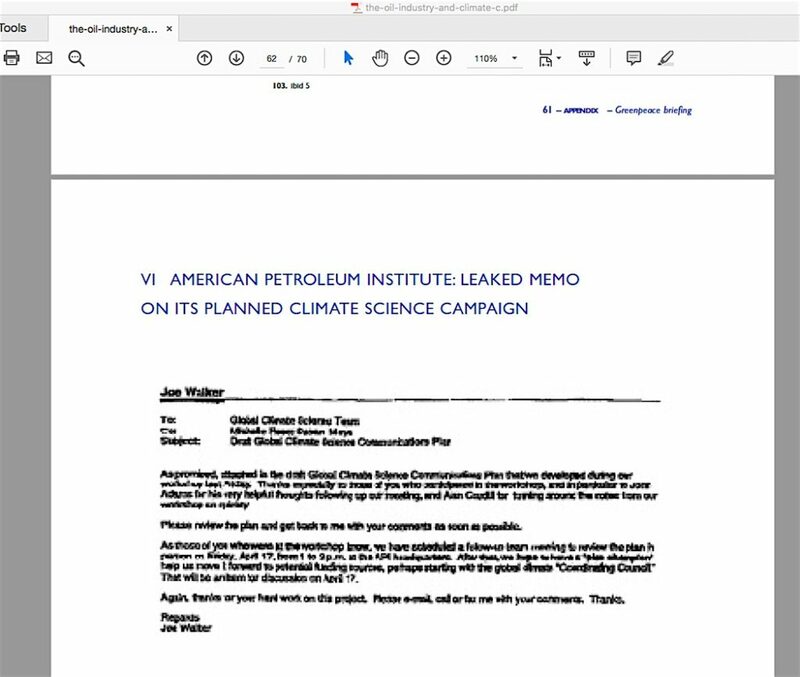 Greenpeace actually undercuts James Hoggan about where their first ‘publication’ of the memo appeared – not in their 2002 “Denial and Deception,” but in their August 1998 “The Oil Industry and Climate Change,” where their scans of the memo are very hard to read, and where they make no claims about their role in “discovering” it. 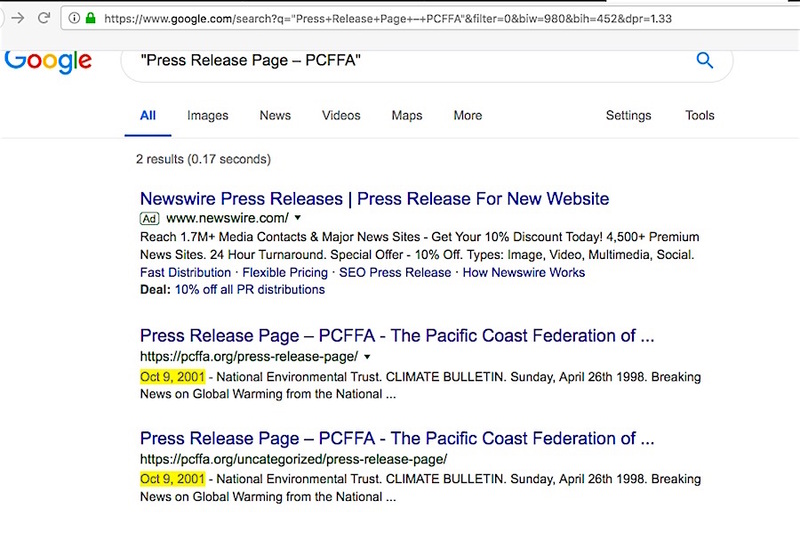 As I illustrated in my prior blog post, the Sher Edling global warming lawsuits oddly link to scans of the API memo (most recently in their latest Pacific Coast Federation of Fishermen’s Associations Inc. v. Chevron case) which are devoid of any source, when there is a nearly identical link identifying ex-Greenpeace figure Kert Davies as the contributor. 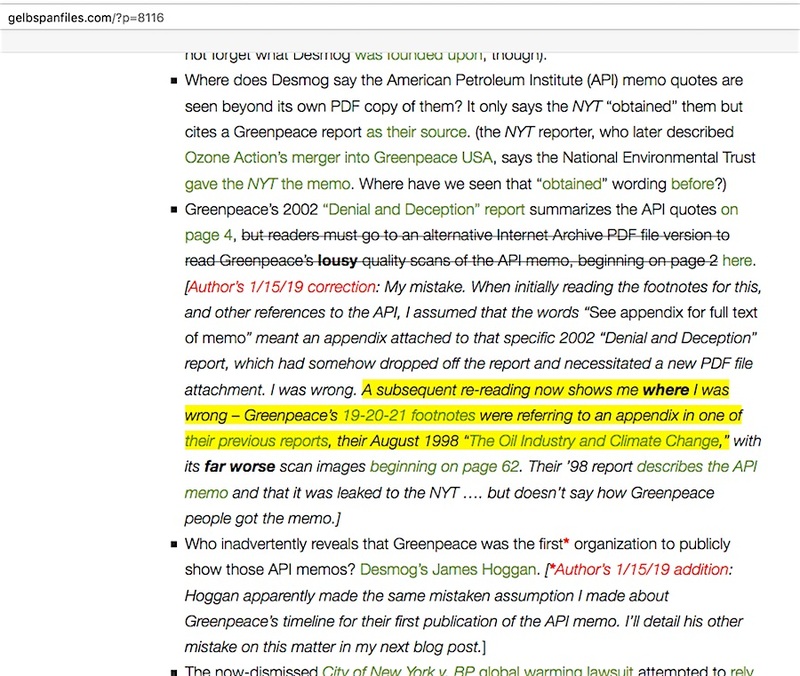 If Greenpeace really was the first to put out the actual API memo in full text form, that might explain why the lawsuits are using Davies’ scans, but the mystery remains regarding why they don’t directly credit Greenpeace. 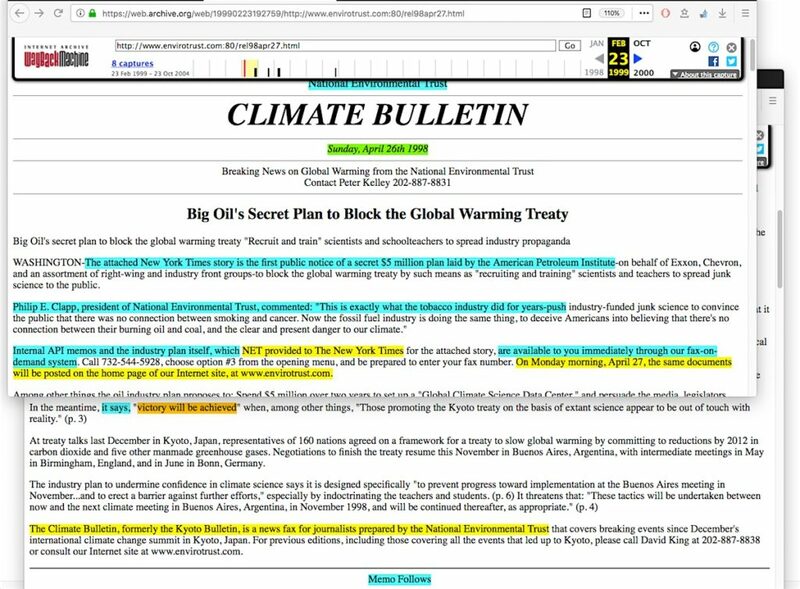 Problem is, the James Hoggan / Greenpeace claims are still totally contradicted by what was stated in the NYT April 26,1998 “Industrial Group Plans to Battle Climate Treaty” article about the National Environmental Trust (NET) leaking the memo. What happens if an intensive search is undertaken to see how the NET was involved? 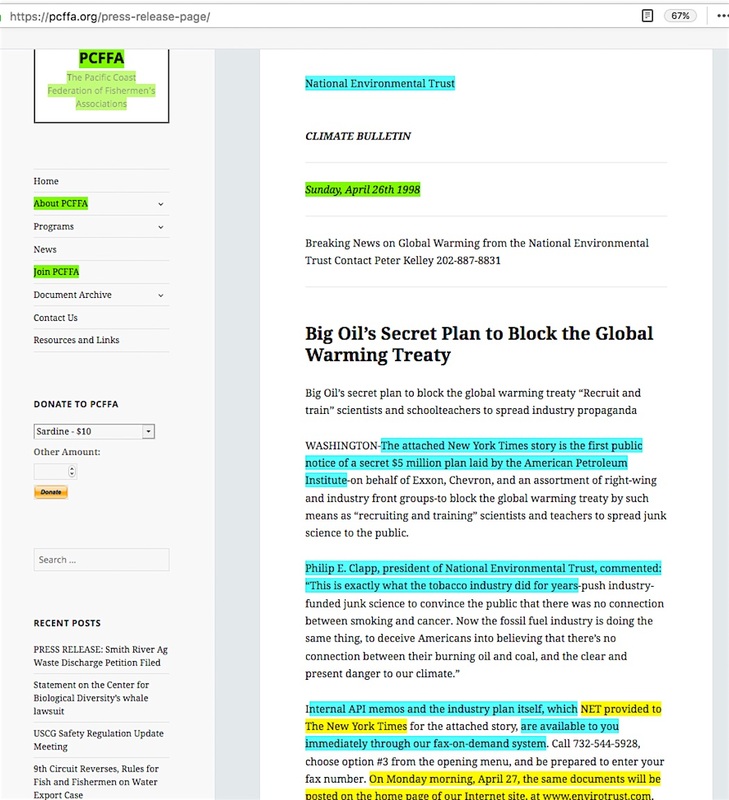 That’s inconvenient for both James Hoggan and Greenpeace, because the only way for Greenpeace to have made the memo available for public viewing first would have been if they had put it out before the NET did. Meanwhile, there is another monstrous current irony to this entire situation. 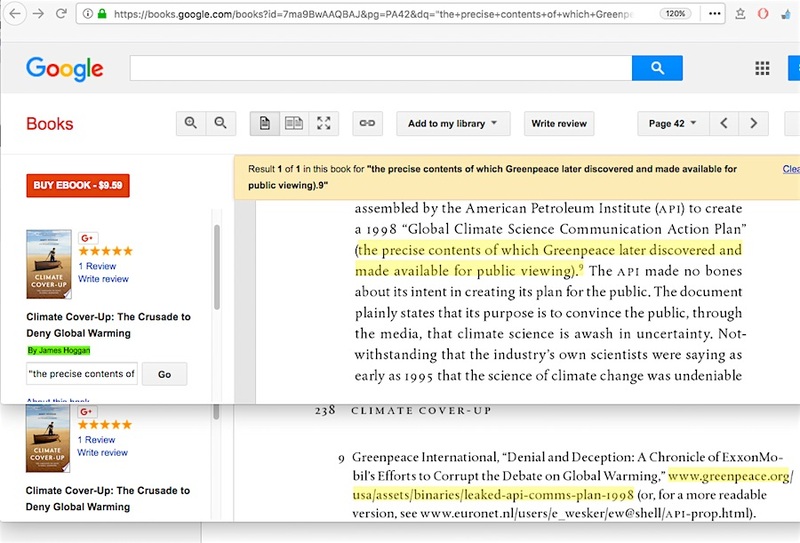 Yes, it would be a bit of a distraction for the Sher Edling global warming lawsuits to refer to the Internet Archive site to display the text of the memo; many people aren’t aware the site exists or might be confused about how long-lost website pages are viewed within it. Why not instead refer to a straightforward current online transcript of the API memo ……. such as the one dating as far back as 2001 at the Pacific Coast Federation of Fishermen’s Associations Inc page? 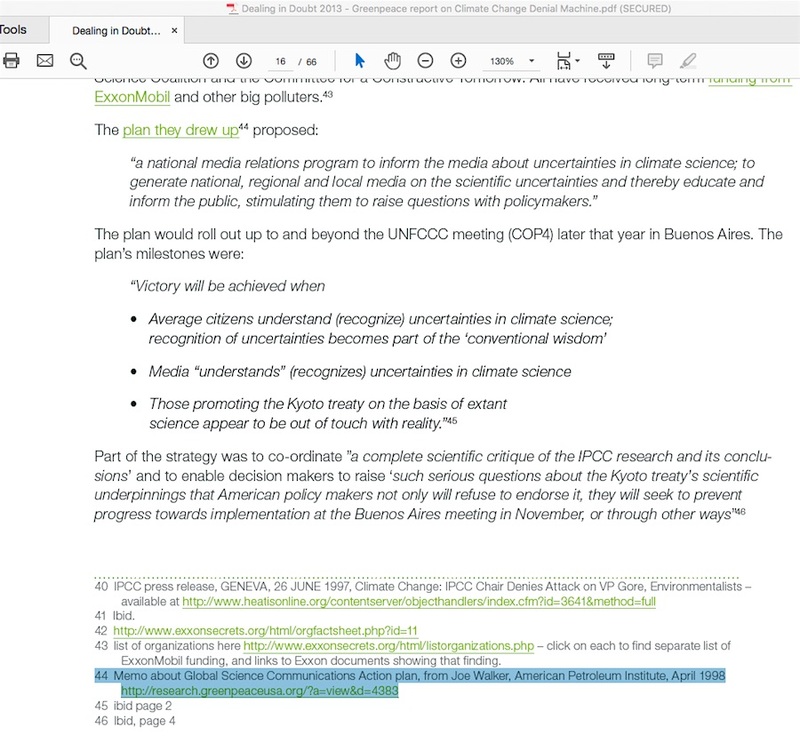 Once again, instead presenting the world with bulletproof evidence of the fossil fuel industry colluding with shill skeptic scientists to spread false global warming information, we have ever-deepening problems surrounding this particular API “Victory will be achieved” angle of the accusation and the core people involved in efforts to promulgate it. Stay tuned for part 3: what’s up with James Hoggan suggesting an easier-to-read text-only version is seen at some Dutch site run by a user named “E Wesker“? This entry was posted in American Petroleum Institute, Information burial and tagged Desmogblog, James Hoggan, Kert Davies by Russell Cook. Bookmark the permalink.